By 1973, 91 year-old Éamon de Valera had been President of Ireland for 14 years, and integral to its politics for the past five decades. His final retirement from Irish politics came after a new generation of politicians had taken over the parliament. This surge of youth would not be replicated in Áras an Uachtaráin, however. The race to succeed de Valera saw the two main parties put forward well-known, established candidates. Fine Gael nominated deputy leader Tom O'Higgins for the third time. 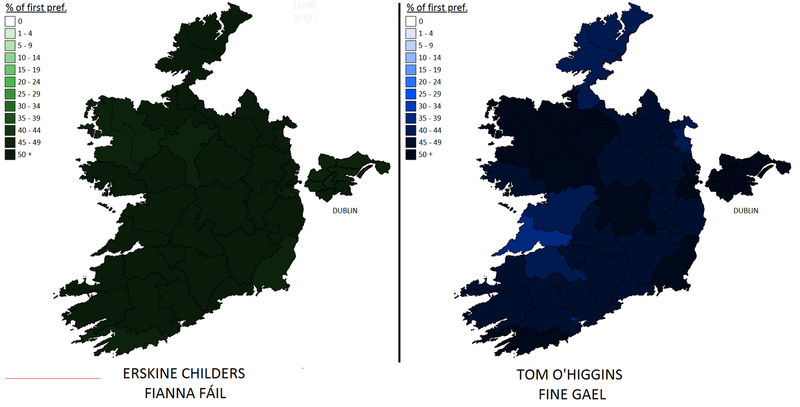 In a huge political upset, O'Higgins had nearly beat de Valera in the previous election. This time he was the favourite to win the election and give Fine Gael their first presidential election victory. Fianna Fáil, in a rare spell in Opposition, nominated former Tánaiste and Minister for Health Erskine Hamilton Childers. Both men proved considerably popular, though O'Higgins was expected to clinch the presidency this time around. In an upset similar to that of 1966, he was instead bested by Childers in what turned out to be a very close race. Only in 8 constituencies was the margin of victory above 5%. In Sligo-Leitrim, the results were exactly split 50-50, an outcome which was very nearly replicated in several other constituencies. O'Higgins won a majority in every Dublin constituency, but this was outmatched by Childers' victories in every other area, bar south west Cork, Mayo and Roscommon. 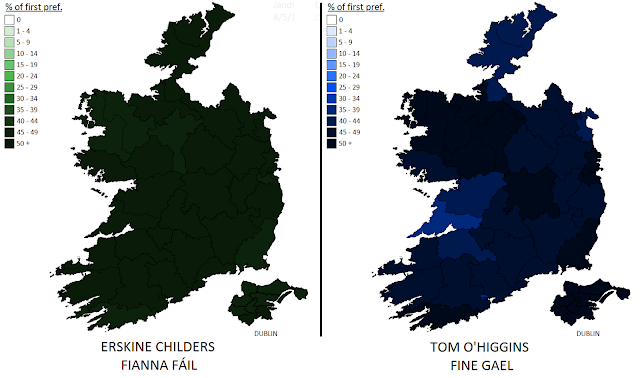 The only area O'Higgins performed relatively poorly in was Clare, homestead of the outgoing president. In yet another unexpected twist, Childers' time in the Áras came to a sudden end when he died of a heart attack in 1974. After some talk of his widow Rita Childers being nominated to succeed him, Fianna Fáil and Fine Gael agreed on a single candidate to fill the vacancy - Chief Justice Cearbhall Ó Dálaigh. He would serve for only another two years before resigning. At this point, people were beginning to question the relevance and necessity of the office of president, particularly after Ó Dálaigh was replaced by another unopposed candidate, Fianna Fáil's Patrick Hillery, whose tenure would restore a sense of grace and dignity to the role. By the time of the next presidential election, 17 years after Childers was elected, the office of president was again one that was actively sought and which captured peoples' interest, not least because that election saw a break from the traditional pattern of seasoned, male party figures seeking the chance to be Ireland's head of state.